Colin Walker is a Bellevue native who’s attended Cross of Christ since the age of 8. A brief time away netted him a Bachelor’s degree from Central Washington University in Ellensburg, but he returned home afterward to complete a Master in Public Administration from Seattle University. He uses his 30 years of handbell experience to serve as director for the Carillon handbell choir, a position he’s filled since 2006. 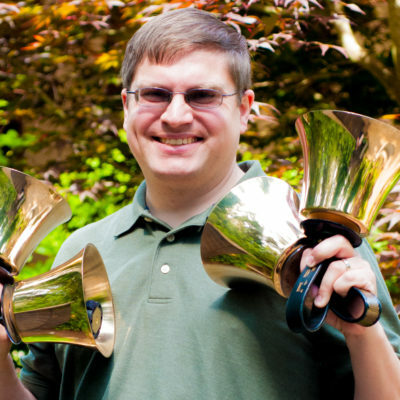 He also rings with and serves as Managing Director for the Emerald City Ringers, a community handbell group serving the greater Seattle area. Colin’s non-musical pursuits include working as Marketing Coordinator for the Parks and Recreation department of a local municipality and spending time with his wife and three children. He finds the convenience and versatility of his cordless drill indispensible.